Know someone that’s a total Batman fan? 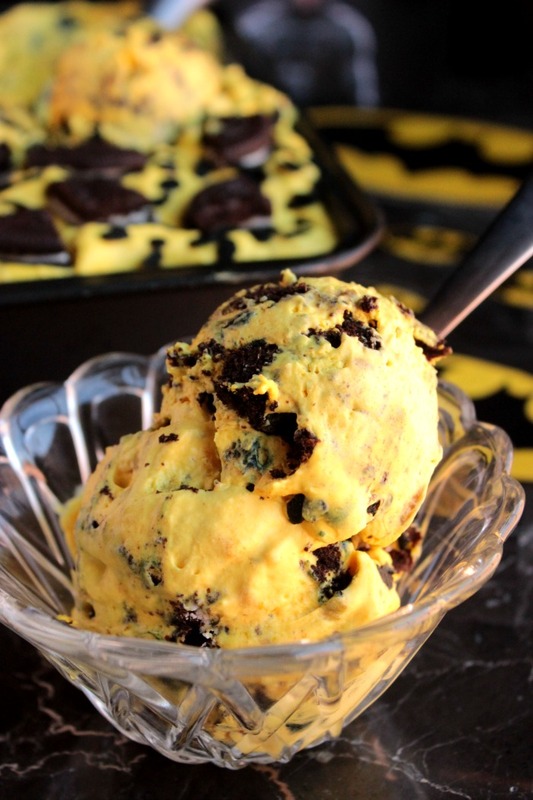 They’ll go crazy over this no churn Batman Ice Cream with bat sprinkles! I’ve never been super crazy about super heros or action movies. I mean don’t get be wrong, there have been some pretty good ones and I’ve seen a lot of them, I just don’t go all fan girl for them. haha I love Captain America, I mean who doesn’t want to see Chris Evans fighting the bad guys as an awesome military man, and I’ve gotten into watching Arrow with Thomas in the evenings but I don’t scramble out to see the newest super hero movies when they come out in theaters. Lies…I do go out to them but mainly because Thomas wants to see them and I like to be a good, supportive wife haha, sometimes I even like some of the super hero movies that we go see. So the newest super hero movie to hit the big screen is Batman vs. Superman! Who’s going to see it? Or who went to see it already? I know some of y’all went to see it last night when it opened late Thursday night! So I’m really supporting Batman for Thomas haha. When it comes to comic books and super heros I’m normally supporting them because of Thomas haha. Well so you see, I’m in this blogging group and every month there is a theme to go along with a popular movie that’s coming out. We create recipes and crafts to go along with that movie and then post about them on the same say and link up to each other’s posts. The last one I participated in was back in November! Our Movie was the Snoopy Movie and I knew I had to participate because well…again because of Thomas. hahaha Thomas loved Snoopy when he was little so I just knew that I had to make a sweet little dessert to celebrate the release of the new snoopy movie. Whelp, the time has come again for me to post with the movie group and this month we’re all posting recipes and crafts for Batman Vs. Superman! So, it’s Batman Vs. Superman. Why did I choose to do something for Batman instead of Superman? Well…I don’t like Superman. GASP! I said it. I know. I’m sorry. I don’t know why. I’ve just never been a fan of Superman. Something about the way he stands with his hands on his hips and his cape flowing in the wind just makes me crinkle my nose. The way he changes in a phone booth makes me wanna give him the side eye, haha I don’t know what it is but I just never did care for him. So I’m going with Batman. I remember watching a lot of the Batman movies when I was younger and I always did fancy Bruce Wayne, I’ll blame that on my inner millionaire haha. Plus his whole costume/theme is centered around bats. I mean HELLO, Halloween loving girl right here. Bats? YES! Oh and there is another cute little reason that I went with Batman. I’m married to Robin. haha You know…Batman and Robin. 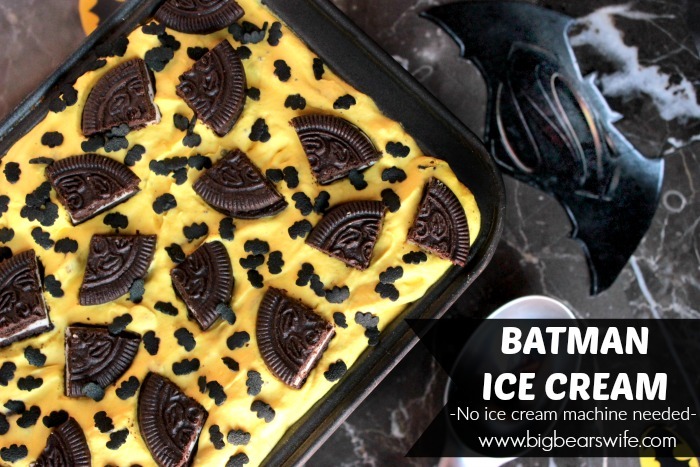 So, let me tell you about this Batman Ice Cream real quick. It’s an easy no churn ice cream that comes together in less than 10 minutes. You’ll need to stick it in the freezer for a few hours to freeze but the freezer will be doing all of the work then! 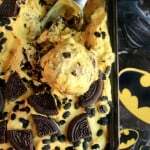 I made this Batman Ice Cream into Banana and Chocolate Cookie Ice Cream. If you don’t like banana just leave out the bananas, it’ll still be tasty. My brain associates yellow ice cream with banana haha so that’s the direction I went in. Are you Team Batman or Team Superman? PS. if you’re team Superman another blogger in our group made Superman Ice Cream! You’ll want to check that link out below this recipe! Know someone that's a total Batman fan? 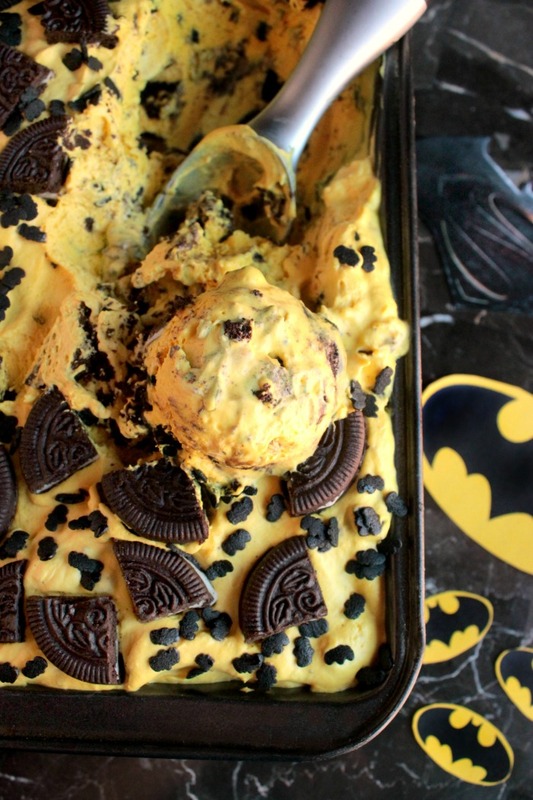 They'll go crazy over this no churn Batman Ice Cream with bat sprinkles!! Add the heavy cream and vanilla to the bowl of a stand mixer. (Or pour into a large bowl and use an electric mixer). Whip heavy cream, yellow food coloring and vanilla together a few minutes until stiff peaks form. Add in the sweetened condensed milk and whisk until combined. Mix in the mashed bananas. Fold 3/4 of the cookie chunks and about 1 tablespoon of bay sprinkles. Top with the rest of the cookies and more bat sprinkles. Freeze for several hours or over night until frozen. **NOTE/TIP** - a glass loaf pan will work but a metal one will freeze the ice cream better. 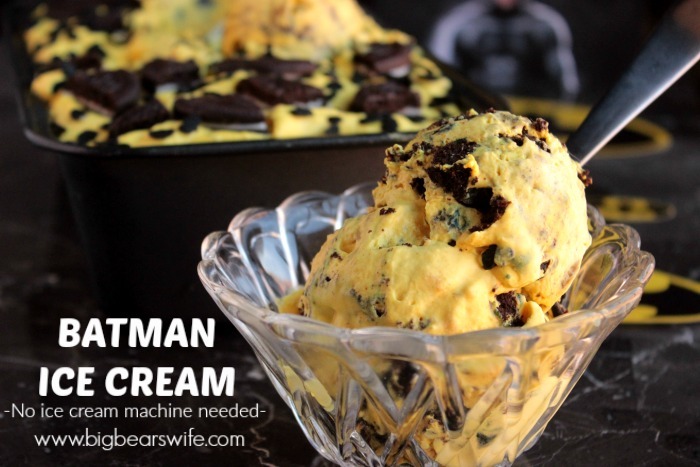 Source: Inspired by Our Family of Seven's "No Churn Cookie Monster Ice Cream"
Check out all of these awesome Batman vs. Superman Recipes and Crafts! 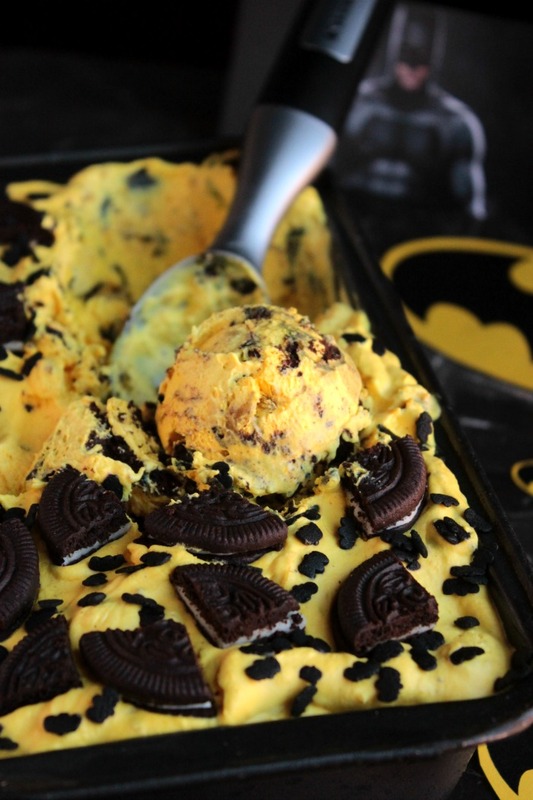 This ice cream looks so cool! I’m not a banana fan so I’d leave that out, but I bet this will still be so good without them. I’ve been wanting to make my own no churn ice cream, so I want to try this recipe. It’d be the perfect treat for after the movie! It’s perfect with or without the banana! I just love banana so that’s why I added to this recipe but this ice cream would be just as amazing without it! I love bananas with ice cream–in it or on it! When it comes to select heros, I’m a fan. I like the movies or tv shows that closely follow the comic book storylines. I know…NERD! Arrow and The Flash are my current favorites, because hello! Stephen Amell! But seriously, as far as Superman vs. Batman goes, I’m more of a Team Superman kind of girl. Superman has that clean-cut boy next door vibe going for him. I used to wish that Superman would swoop down from the sky, pick me up, and fly me to school. Although, Batman does have that dark & brooding bad-boy-esque thing going for him. Oh lawdy! I need to shut up now. My geek is showing. 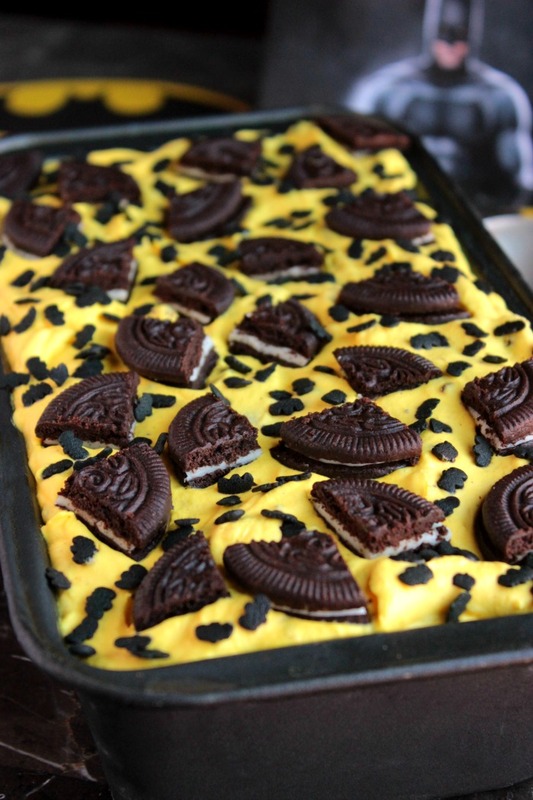 Oh my gosh, this looks so good – and my daughter is behind my shoulder saying the same thing. Batman is my daughter’s favorite (she’s on the same team as you), so I’ll definitely have to make this for her! How adorable! 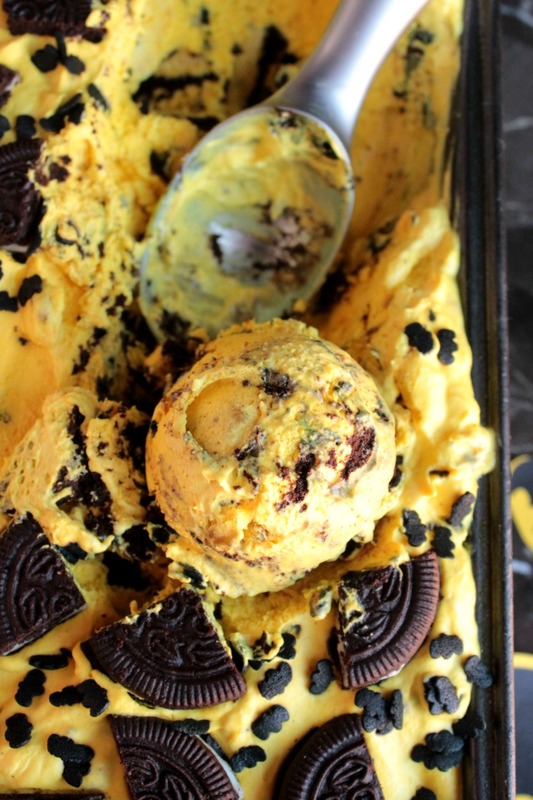 This ice cream with those oreos looks amazing! I love this. The color is incredibly vibrant and there is no mistaking the Batman theme. So creative. Oh my!! My son would love this!! I have a room of my house that is almost entirely Batman. My hubby is a big fan (tech he loves Nightwing the most but he’s a member of the Bat family so…yeah) so I can completely relate! and I loooove this ice cream-so cute! 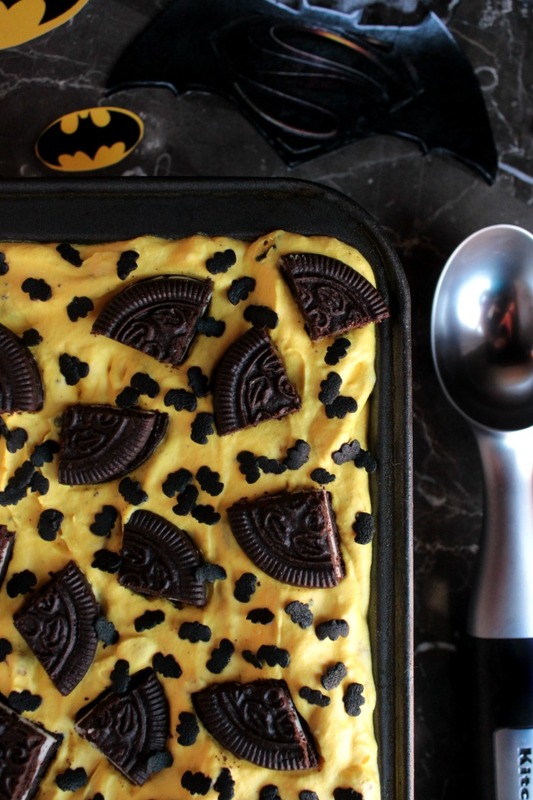 wow… such a creative recipe! my son will love this so much !!! This is an awesome recipe! My daughter will like it so much! This looks an awesome ice creme recipe for my 2 years old son. Going to prepare it for him soon.